Destination clubs are sprouting up all over the world. Southern Africa is no longer exempt from this trend in high-end luxury vacations. Dream Circle Destinations, headquartered in South Africa, is a new shared ownership destination club promising members a return on investment after a 12 year run. The Dream Circle Destinations portfolio will include 25 homes in the $1.5 million to $3 million range (ZAR10-20 million) as well as a 57ft Princess motor yacht. 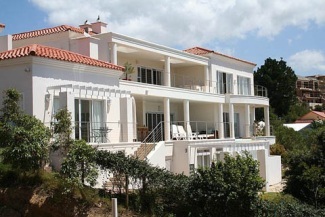 The first wave of homes, ready for use on March 1, 2008, includes locations such as: Fancourt at George, Eastern Cape; Simola at Knysna (pictured below); Prince's Grant golf estate; Plettenberg Bay (pictured right); St Francis Bay, Eastern Cape; V&A Waterfront apartment, Cape Town; and the Welgevonden Private Game Reserve, Limpopo Province. As membership numbers grow so will the destinations. The club will open more locations at the Cape's V&A Waterfront and wine lands, the Garden Route, KwaZulu-Natal and Big Five game lodges, Kenya, Mauritius and the Seychelles. Currently, their smallest unit is a two-bedroom, 1,500 sq ft waterfront apartment. However, most homes in their portfolio average around 5,500 sq ft. The game lodge is their largest residence at 10,000 sq ft. The yacht is a 57ft Princess motor yacht berthed in the V&A Marina in Cape Town and accommodates 6. Similar to other clubs in its category, Dream Circle offers special services for members, such as: pre-stocked refrigerators, hi-tech multi-media equipment, concierge services, etc. 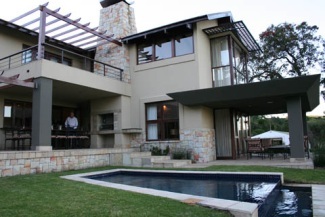 "We are accumulating homes at golf estates," says Managing Director, Ian Beauchamp," and at in-demand new courses like Meletsi in the Waterberg and Pearl Valley in the Cape. In each of those homes there will be four sets of golf clubs waiting when you arrive. It's cumbersome to drag your own golf clubs along on holiday; as a member all you need to pack are your shoes, a glove and some balls. Likewise, the whole family needs to share the fun. Bicycles, fishing rods, boogie boards - all the toys-of-choice are on hand in the homes, up to date and fully maintained." Dream Circle's concept is to build membership in three phases. The investment opportunity for first wave members is an initial buy in of approx. $340,000 (ZAR 2.2 Million) and annual dues will run members $15,000 (ZAR 96,900). All members will be able to enjoy 32 days of usage a year for 12 years. After the 12 year mark, Dream Circle will sell the homes and return initial investments to members along with a share of the profits. How long do new members have to jump on this first wave investment opportunity? The deadline is March 1, 2008. After the 55 first-wave preferential share members are set, the roll out of memberships will continue with an additional 55, and then a third wave of 58, totaling 168 members. The club plans to increase buy-in rates subject to demand. Why limit the total number of memberships so early in the process? Dream Circle will keep the annual occupancy at 65 percent so their members can consistently book optimal vacation time. Dream Circle Destination Club is a new division of Mirage Leisure & Development, www.mirageleisure.com. Mirage was founded in 1995 and has since developed projects in South Africa, Mauritius, and the United Arab Emirates such as Dubai's Royal Mirage. Mirage supported Ian Beauchamp's research and proposal for crafting a South African destination club and attracted a leading South African bank to take an equity stake in the project. "We were looking for an equity partner with similar values to our own and a brand that would give our Members security in their investment," says Beauchamp. "Standard Bank fitted the bill perfectly." As an equity destination club, Dream Circle has a similar ownership structure to Crescendo Residences , M Private Residences and The Hideaways Club. Both Crescendo and M Private have a mainly North American focus, whereas The Hideaways Club has a more European focus. Having similarly structured clubs in other parts of the world will offer member/investors the opportunity to enjoy multiple home ownership and have a return on their deposit. Having an established property company as a parent, together with financial backing from Standard Chartered will certainly help Dream Circle succeed. As with all clubs we recommend members do their due diligence prior to joining, understand where your money ranks in relation to the financial investors money and ask what happens if the club only adds members at a slow pace, compared to the actual plan to reach full membership.